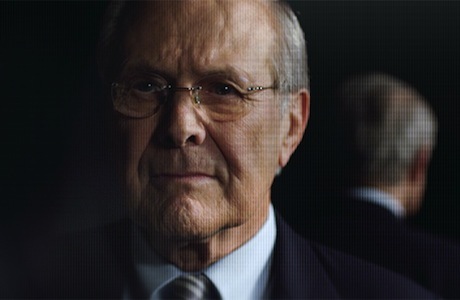 In his studious manner, heavyweight documentarian Errol Morris (The Fog of War) uses the professional life of former U.S. Secretary of Defense Donald Rumsfeld to explore the concept of disinformation through dilution. Using a mix of historical footage, eye-catching info graphics, superimposed dictionary definitions and symbolic nature shots — oceans, snowstorms and starry night skies are inserted to represent the vastness in which innumerable molecules of information float — Morris builds his case from a current interview with the political insider. A quietly commanding speaker with a mischievous glint in his eye and an easy sense of humour, Rumsfeld answers the probing questions posed to him with the reassuring false candour of someone who's been publicly handling touchy subjects for years, which he has. Rhetoric, doublespeak and swift mental manoeuvring are essential tools of the political trade and it's fascinating to watch a man try to come clean with those habits (and obligations) so ingrained. He does seem to be trying his best to be as honest as is permissible. But always there's his knowing smile that only ever hints at the truth; he knows we know that he knows something we think we know. To give the material shape and thematic muscle, Morris approaches the big questions about Iraq and the Bush administration by way of Rumsfeld's penchant for memo writing. He calls them snowflakes and we see samples of these concise departmental missives throughout the film to get a more distinct picture of how information was circulated around the time of the defining moments of his political career. Rumsfeld, who looks very pleased with his ability to conjure sound bites whenever a catchy turn of phrase finds his tongue, smoothly wriggles around topics while Morris tries to pin down his meaning with extremely specific, well-researched questions. Somewhat surprisingly, wherever he can afford to be, without directly revealing more than he should, the man who's influenced American foreign policy for decades is quite candid. More predictably, his areas of transparency tend to concern his personal feelings about well-known historical incidents, such as Watergate, and not his own personal contradictions. Not one to softball, Morris calls him out on discrepancies in public statements, pulling support footage when his interviewee questions him; ever-fluid, Rumsfeld incorporates his errors into whatever position or etymological line of thinking he's pursuing. The fickle power of words is vital to this document, specifically the nebulous potency that comes from moulding definitions to suit a purpose. Many of the broad strokes about the war are already thoroughly disseminated topics, but what we don't learn is quite telling. Less surreptitiously, The Unknown Known works well as a humanizing overview of an influential, long-time force in American politics and as a look at how information, and the lack thereof, can be warped or harnessed. A memorable, tastefully restrained Danny Elfman score is a pleasant bit of sonic icing on this typically well-made documentary.